The Eva Trio set of pots inspires with three pots of differing sizes plus a practical pasta colander. This makes the pots suitable for pasta dishes as well as soups, stews and other dishes, allowing them to be prepared quickly and gently in the pots. Made of high-quality stainless steel, the cookware has a high wear resistance and is built to last. In addition, the pots are extremely easy to clean, so all of the Eva Trio pots in the Stainless Steel series can be washed in the dishwasher without hesitation. It is also suited for preparing food in the oven. 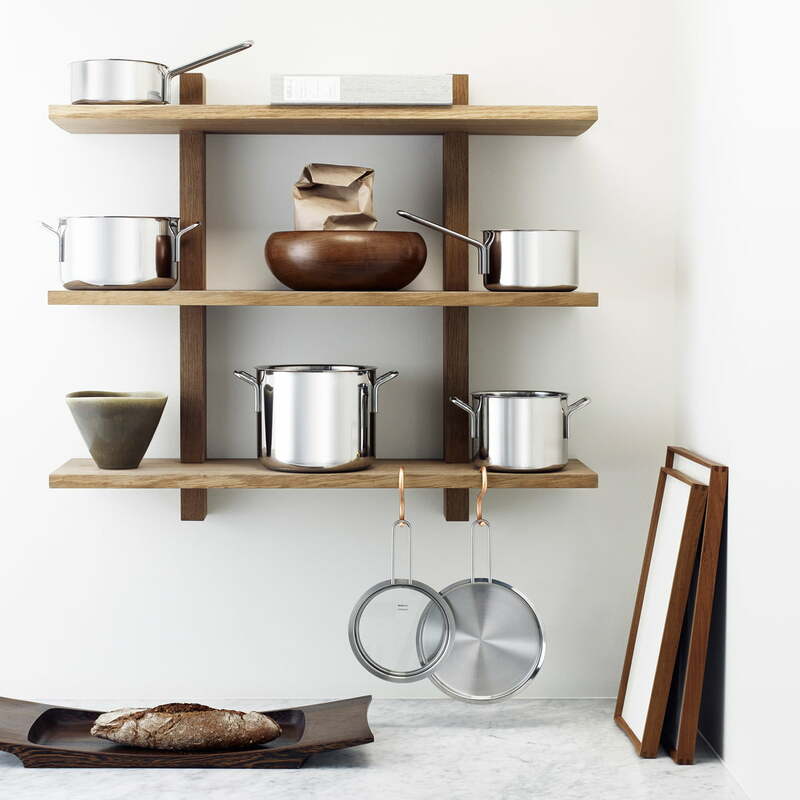 After cooking, the Eva Trio cookware can be stacked to save space - thanks to the differing sizes - and conveniently stowed away in the cupboard. 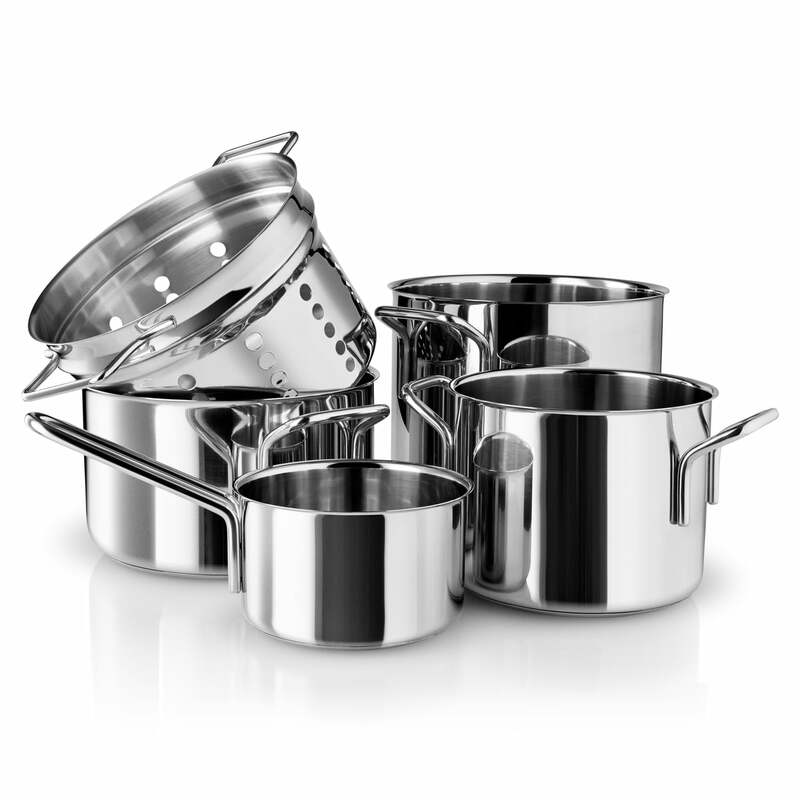 Isolated product image of the stainless steel pasta set by Eva Trio: The set of 5 includes a 1.1 L saucepan, 3 cooking pots of 2.2 L, 3.6 L, 4.8 L and a pasta colander. Lids are not included. 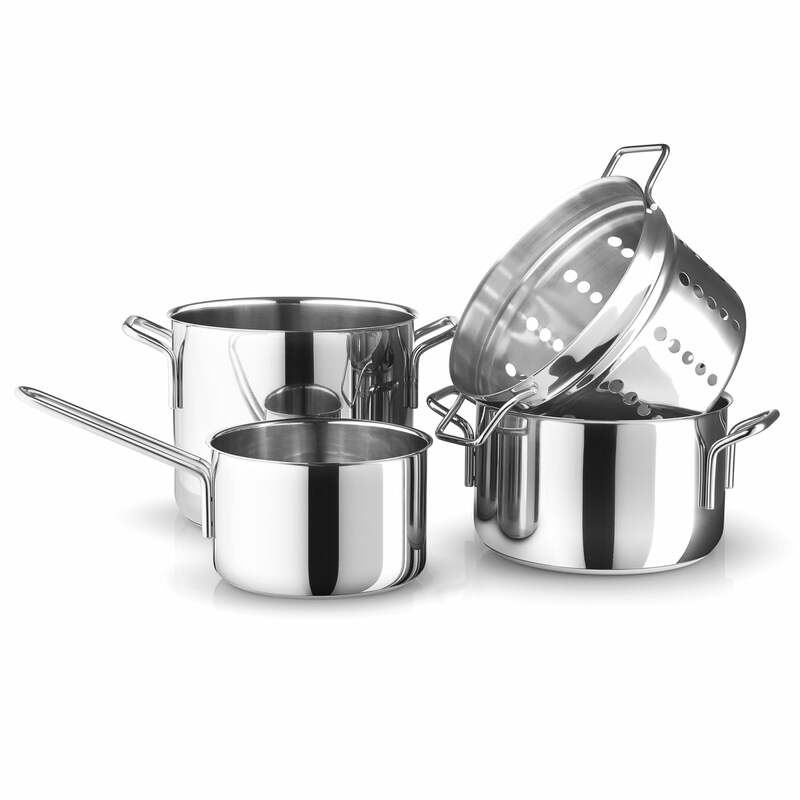 Group picture of the stainless steel pot set by the manufacturer Eva Trio consisting of a saucepan without lid, two pots and without lids and a pasta colander. 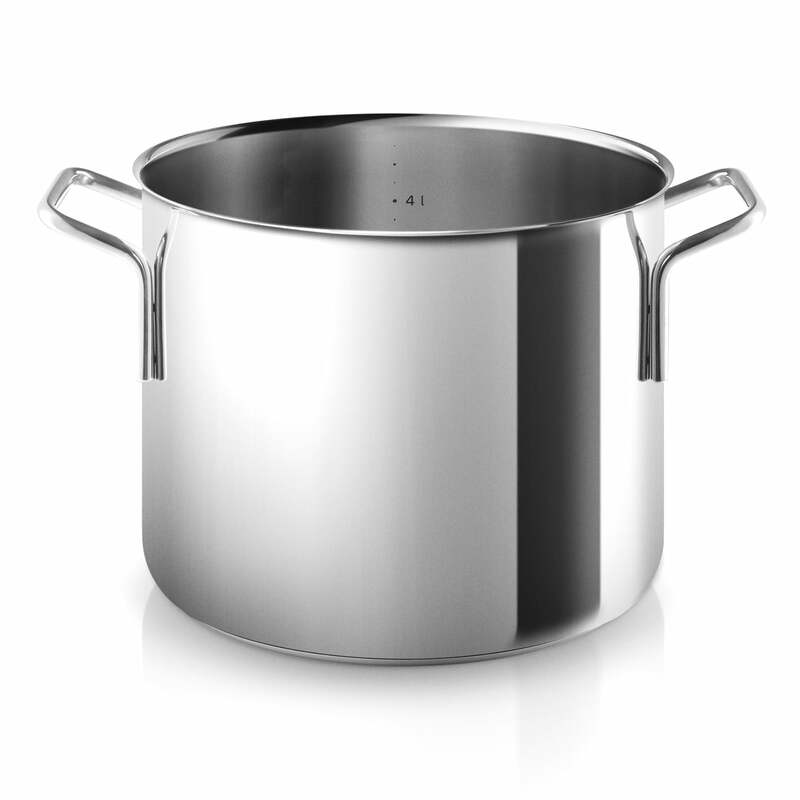 Individual image of the Stainless steel pot with a capacity of 4.8 L by Eva Trio. The pot is suitable for every kind of hot plate, including induction, and is dishwasher-safe. 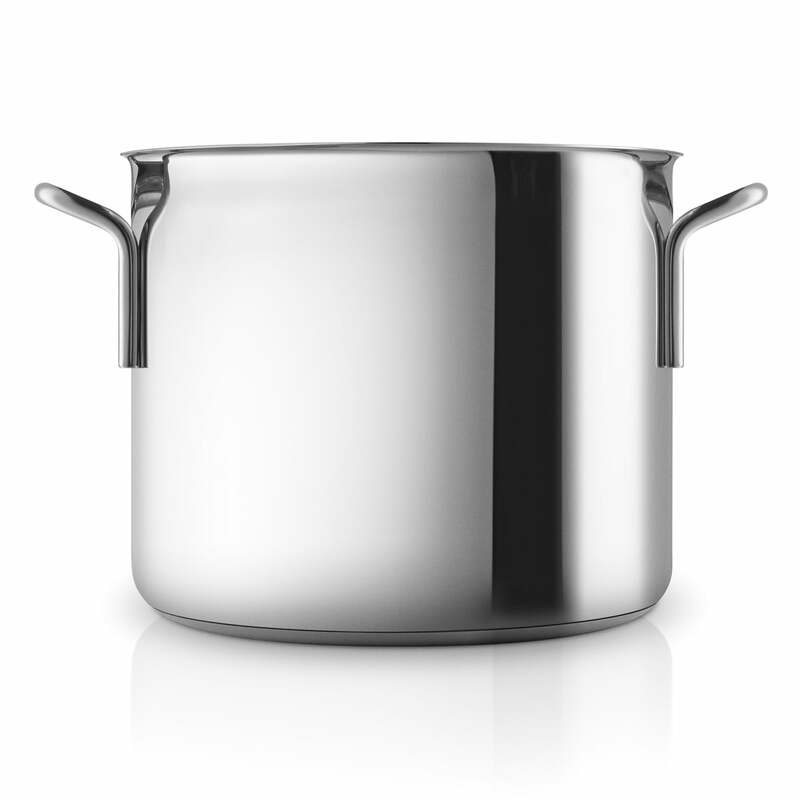 Individual image of the Stainless steel pot with a capacity of 4.8 L by Eva Trio. It was designed by Ole Palsby, who designed the pot and pan series in 1977. 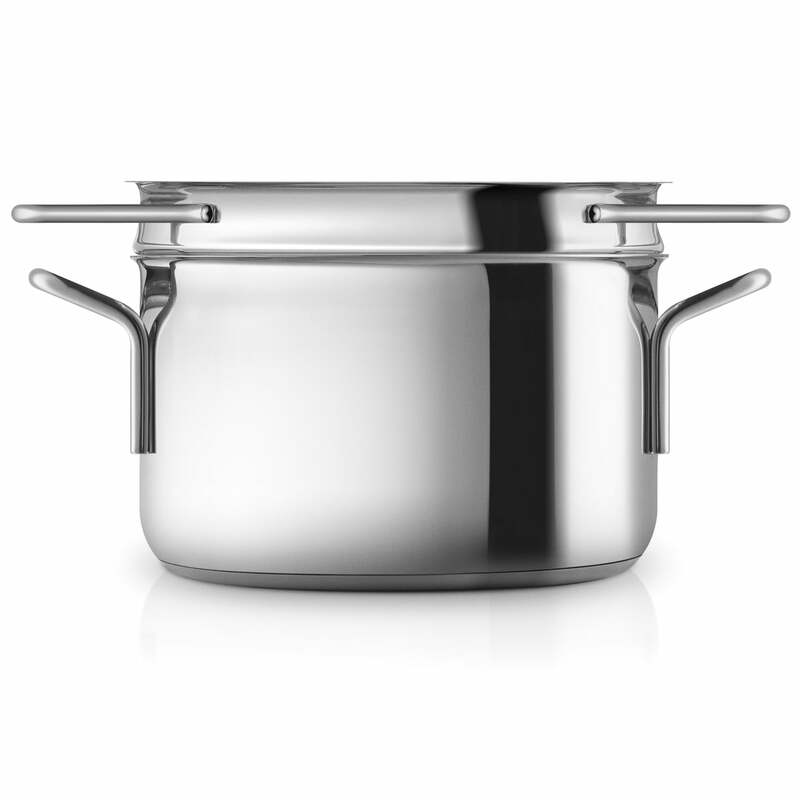 Individual image of the Stainless steel pot with a capacity of 3.6 L by Eva Trio. The pot is suitable for every kind of hot plate, including induction, and is dishwasher-safe. 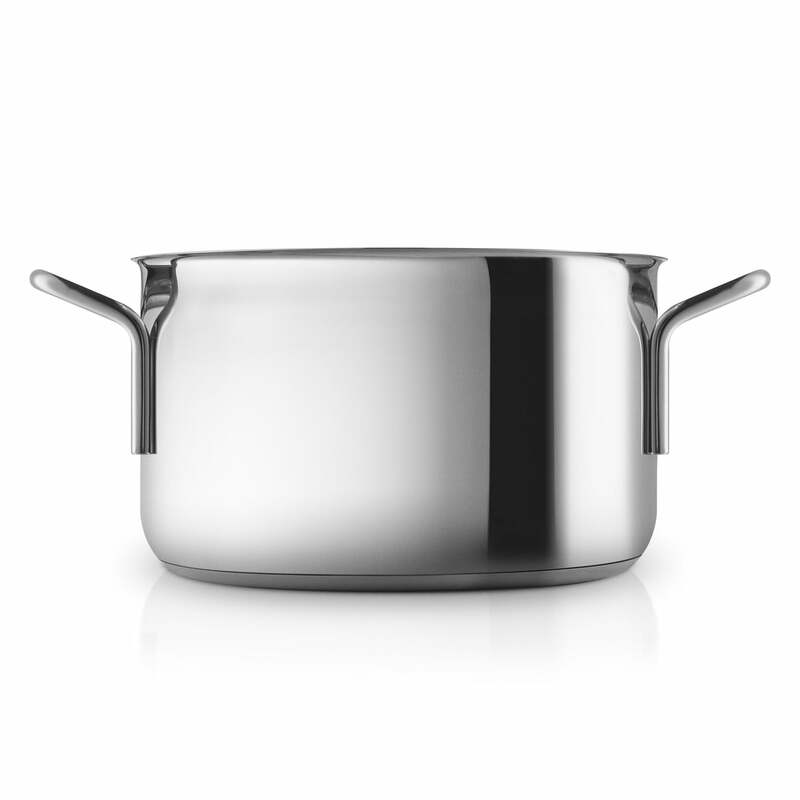 Individual image of the Stainless steel pot with a capacity of 3.6 L by Eva Trio. It was designed by Ole Palsby, who designed the pot and pan series in 1977. 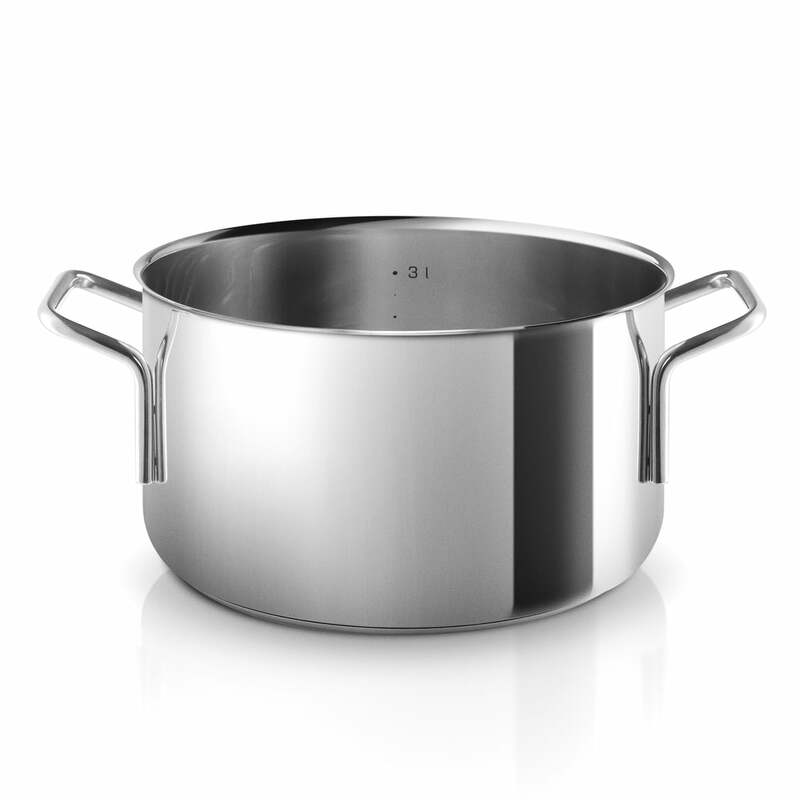 Group picture of the Stainless steel pot with a capacity of 3.6 L, with pasta colander by Eva Trio. The sieve fits the pot in the Eva Trio series perfectly. 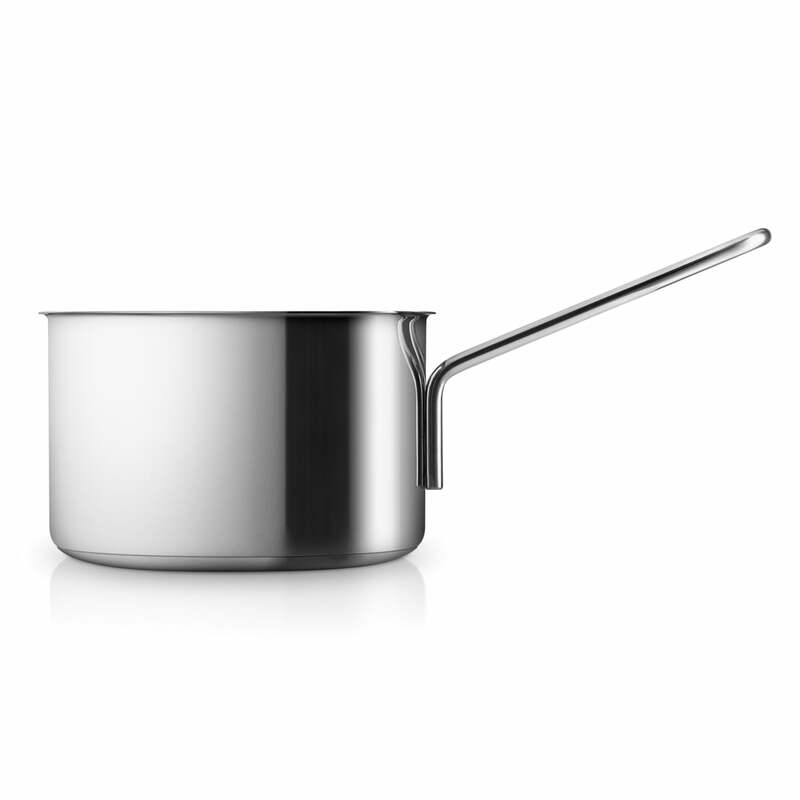 Individual image of the Stainless steel saucepan with a capacity of 1.8 L by Eva Trio. 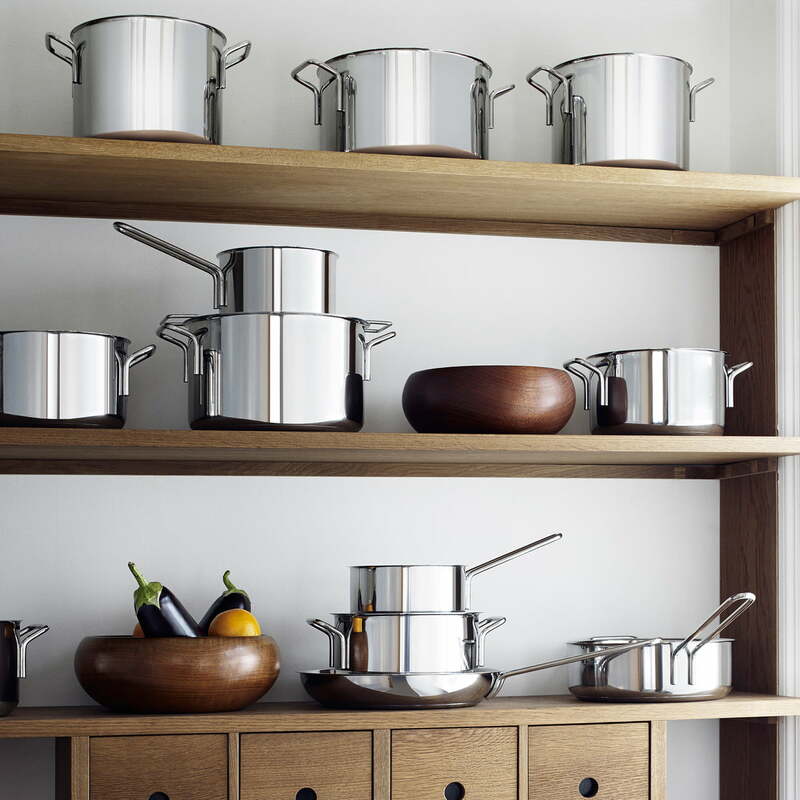 The saucepan is suitable for every kind of hot plate, including induction, and is dishwasher-safe. Eva Trio has worked on the pot and pan series by Eva Solo and the result is a revised and improved set of products from the series, which complement the design innovatively and contemporarily. For each pot there are multiple matching lids. All pots are made of high-quality stainless steel with high wear resistance, which thanks to the smooth and polished surfaces are very easy to clean and maintain.